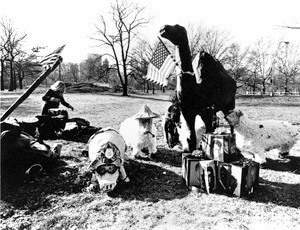 On Christmas Day, Joey Skaggs and friends constructed a life size Vietnamese Nativity scene in New York’s Central Park and, dressed as American soldiers with plastic and wooden weapons, attempted to burn it to the ground to protest the war in Vietnam. In the days prior to the event, Skaggs had announced his intentions to Bob Fass on WBAI Radio. When his three trucks arrived carrying the sculpture and actors, he discovered that the place was swarming with not only supporters and onlookers, but with journalists and police. He quickly moved the event to a different site. 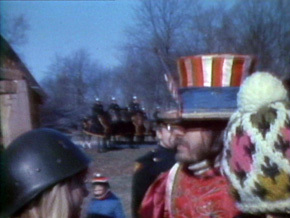 The group feverishly tried to erect the sculpture, which consisted of a wood-framed manger covered with bamboo shades; papier-mâché pigs with police caps, badges, and guns; white middle class sheep with attaché cases; a huge camel representing Hubert Humphrey; three beheaded wise men representing dead Jack and Bobby Kennedy and Martin Luther King; a Vietnamese baby Jesus in the manger; and Vietnamese peasant sculptures of Mary and Joseph. Before the Nativity could be completely erected and burned, the police and journalists found the protesters. Many were arrested. The headline in The New York Times the next day read, “Yippie ‘Nativity Scene’ Leads to Tickets for Littering,” which did not adequately portray the intent of the piece.